A recent trip down to Dunsborough, a popular holiday destination a few hours south of Perth, gave me the opportunity to visit a garden I had last seen 15 months ago, just after it had been installed. 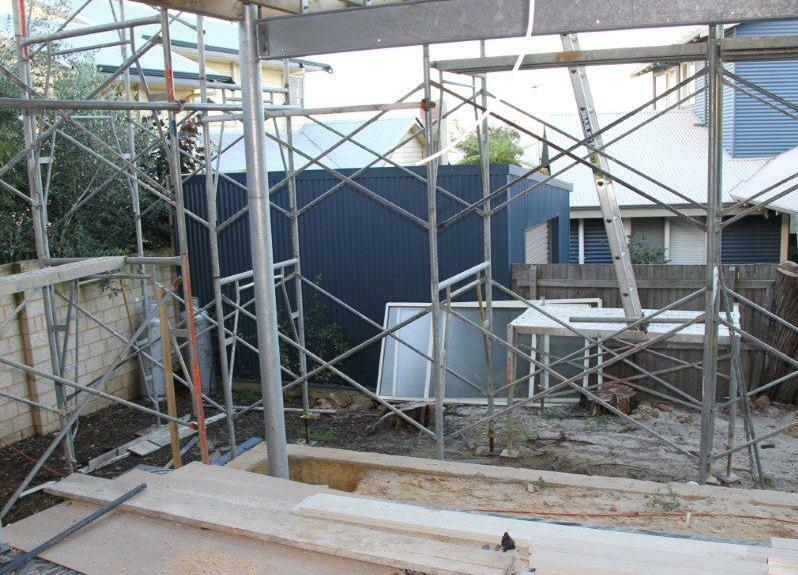 The owners had asked me to design a garden for their weekender which was being renovated and extended to include a second storey. They wanted the garden to be lush and tropical with plenty of scented flowers and herbs, to have a seating area off the deck, to retain the existing peppermint (Agonis flexuosa) tree and to have a feature stone wall from the deck down to the boundary fence to ensure that their two dogs were kept in. They also wanted the garden to look special at night; they were open to the idea of a water feature and liked the look of vertical gardens. A few issues regarding the site had to be addressed within the overall design. 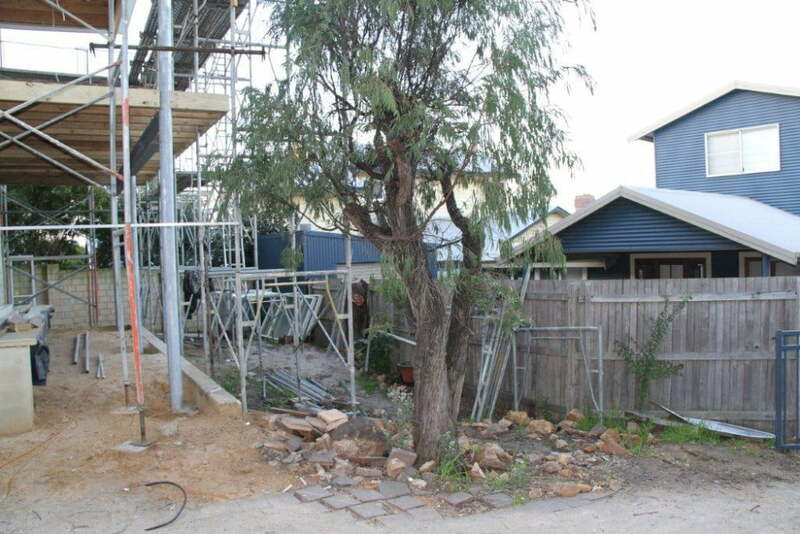 Firstly, a number of neighbouring two storey houses were visible from within the proposed garden. To screen them out would require some tall growing plants but the view of the ocean from the second storey balcony had to be preserved. To complicate this there was only 3.5m (11 ft 6 inches) between the balcony and the boundary fence so using large trees for screening was ruled out. The clients were keen on using mainly bamboo for screening but I was initially cool on the idea because to look its best, bamboo requires a fair amount of water. We compromised by using bamboo (Bambusa textilis var ‘Gracilis’) only in the narrowest garden beds and I must say they do look stunning. The other screening plants are Hibiscus tiliaceus Rubra which are often grown for screening as they are evergreen and fast growing but have relatively soft wood, making them easy to prune. Their tolerance of alkaline soil and salty winds was also a factor in selecting them. The idea is that they can be pruned to create an informal pleached effect, screening out the buildings but allowing the view to be retained and for other plants to grow beneath the canopy. The ability to look through under the tree canopy gives the illusion that the garden is deeper than it is. Secondly, because the garden is quite narrow it was important that the boundary fences receded into the background. There was a mixture of materials used for the fences including cream coloured bricks, timberlap and the parapet wall of a neighbouring shed. Changes in materials can be very distracting, particularly where they intersect and are of different heights and colours which don’t harmonise. 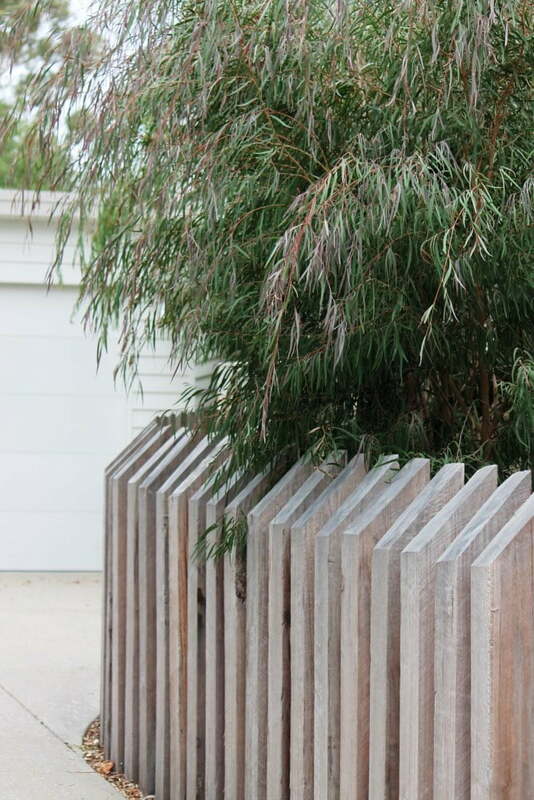 I would have liked to reuse the existing timberlap which had aged to a lovely silver colour, so appropriate for the coastal setting of the garden, but for various practical reasons a new timber fence was installed. It will eventually fade and be screened by planting. The shed wall was painted silver grey which is far less intrusive that the original blue. 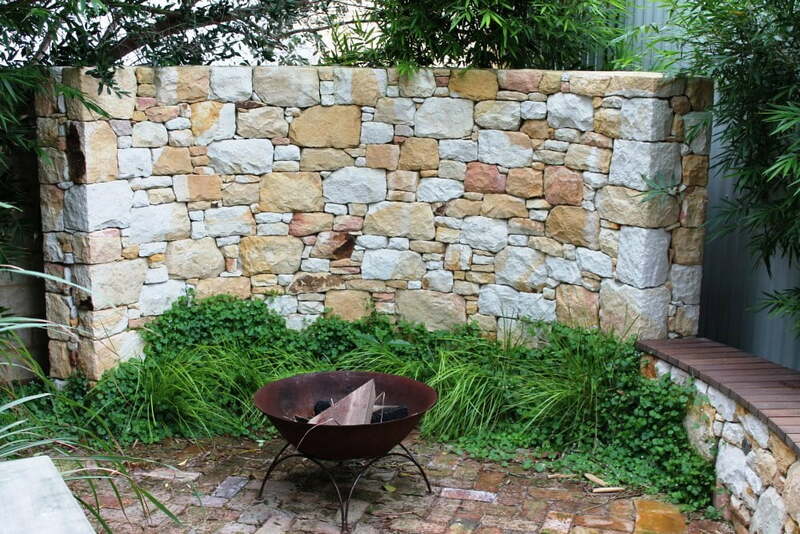 One of the features of the garden is the beautiful curved Donnybrook stone wall which screens the corner where the brick and shed walls meet and defines an intimate paved area featuring a curved seat and fire bowl. Bamboo is tucked in behind the wall to give additional tall screening. A vertical garden was considered here instead of the stone wall but as the house would be a weekender for the foreseeable future I felt that maintaining a vertical garden to a good standard may be difficult. 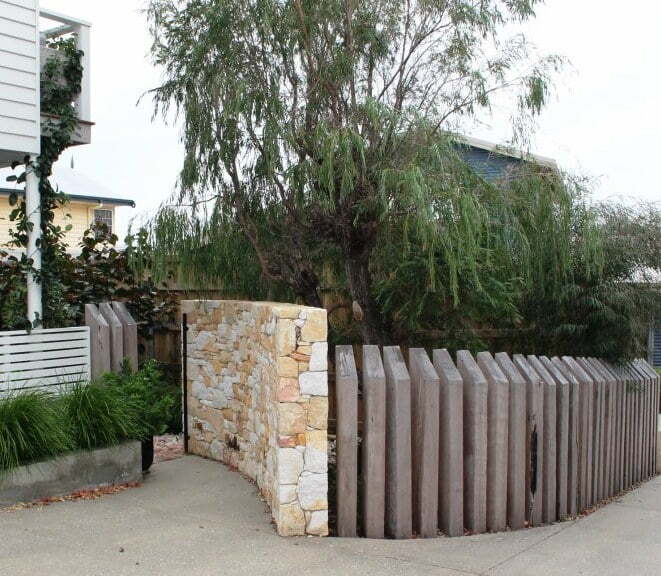 An advanced frangipani planted in a raised planter screens the existing shower and side boundary fence from the deck. Thirdly, there was a fall of nearly 1.5m (5 ft) from the top of the deck to the bottom of the boundary fence. 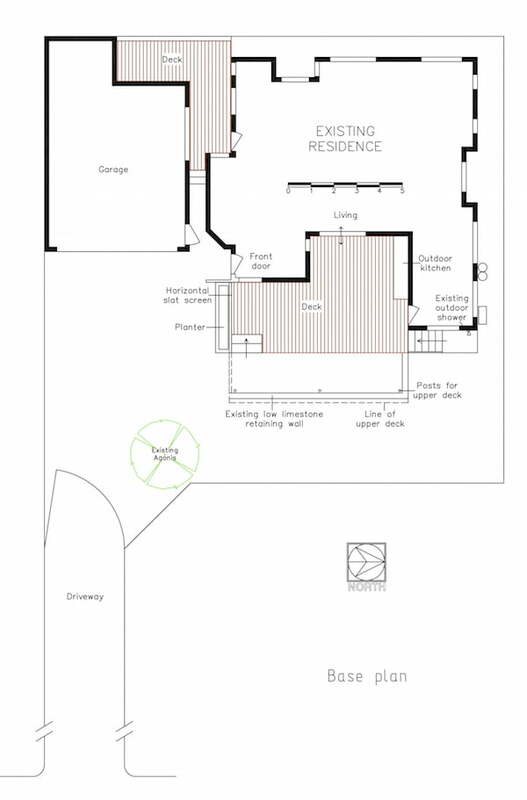 Two sets of steps were already on the plans (see Base plan above) when I was asked to do the garden design and in fact an opening for one set of steps had been left in the completed deck. 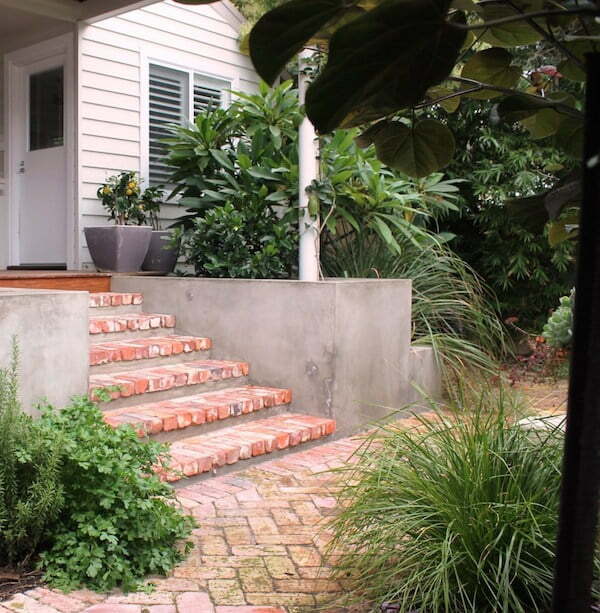 I was unable to reconcile the position of these steps for a number of reasons; including that they were too close to the driveway making entry into the garden very tight and cramped and also that most of the deck would become a thoroughfare linking the two sets of steps to each other and to the living room. 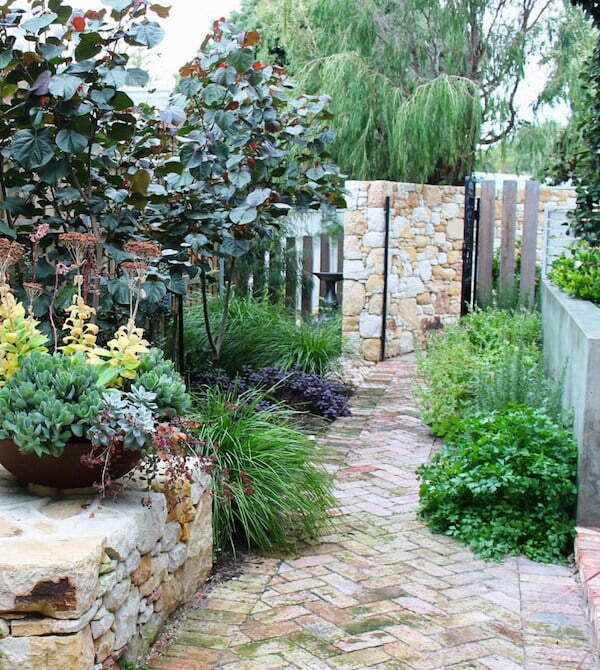 Interaction with the garden would also be limited and very indirect. Building a new set of broad steps, more centrally located, created an inviting direct link with the garden and allowed one end of the deck to be used as an al fresco seating area. 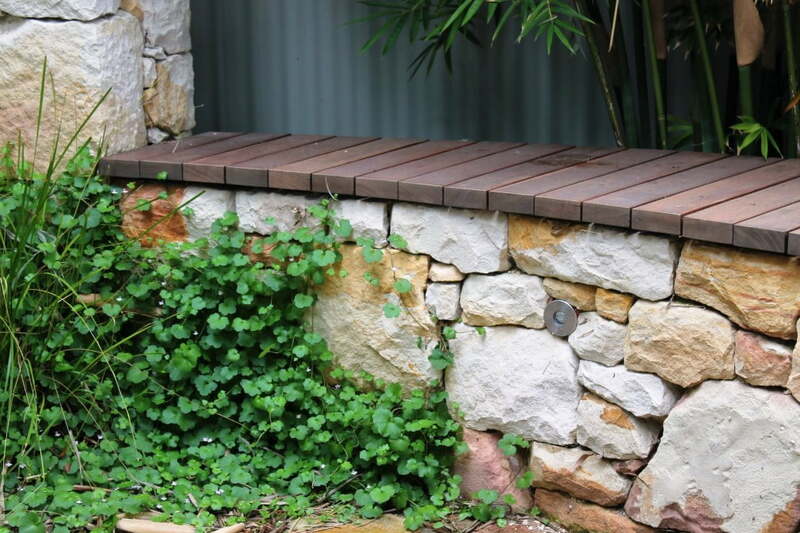 The height of the existing low retaining wall was increased, bringing the plants right up to the deck level. Additional retaining was also undertaken on the boundary before the new timberlap fence was installed. Lastly, the house is situated on a battle-axe block and is therefore accessed by a long narrow driveway which opens out into a large paved area, punctuated only by the retained Agonis tree. 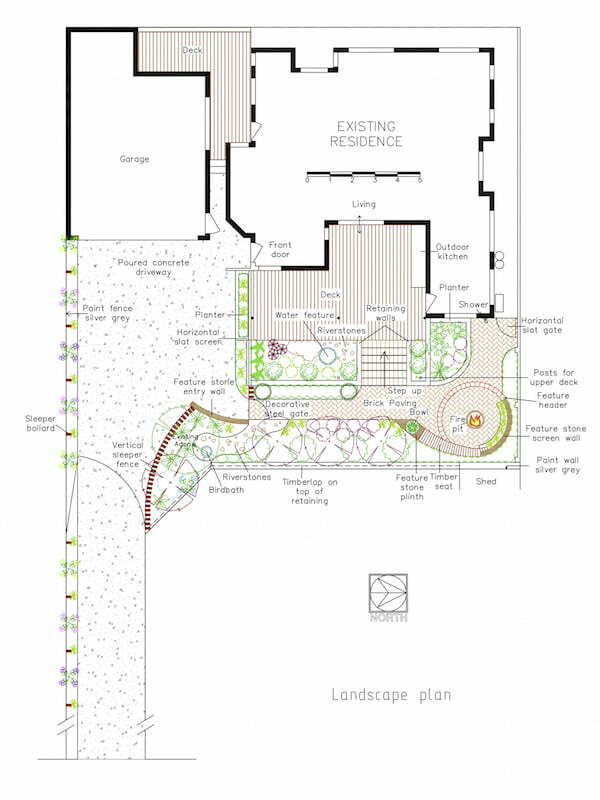 To make the entry to the property more interesting and to reduce the paved area, the garden was extended as much as possible while still allowing for the parking and manoeuvring of cars. Vertical sleepers with chamfer to accentuate curve. The resulting curved bed is edged with vertical timber sleepers with chamfered tops which accentuate the curve. The sleepers provide privacy when approached along the driveway but also allow views into and out of the garden at certain angles. I thought that the dogs in particular would enjoy being able to see out so the planting in that area is minimal and tough. 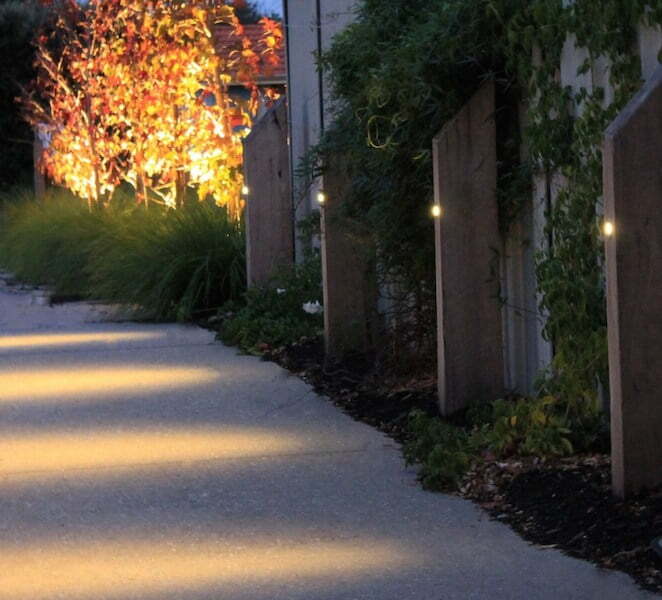 Vertical sleepers (with integrated lights) are placed along the driveway to help focus attention on the entry to the property. 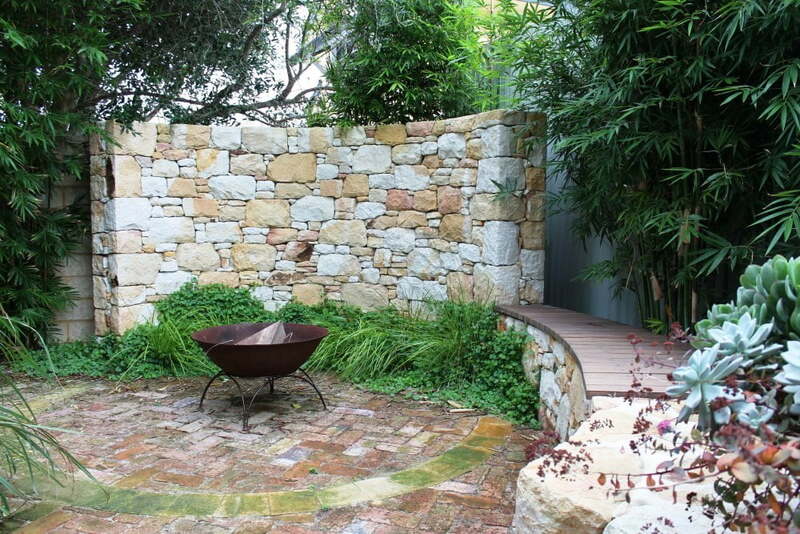 The last link in enclosing the garden was to create a curved Donnybrook stone wall from the vertical sleeper fence back to the garden and install a gate. 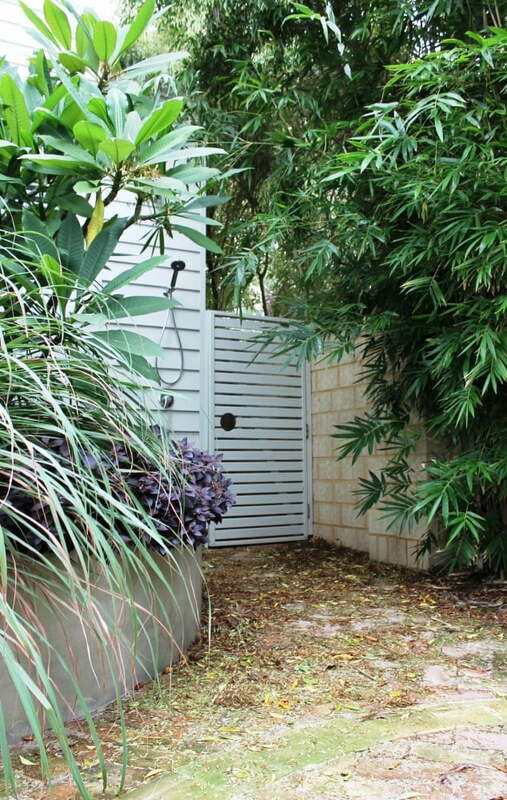 This has the effect of creating a transition zone, funnelling from the wide open paved area down to the lush, almost hidden garden. 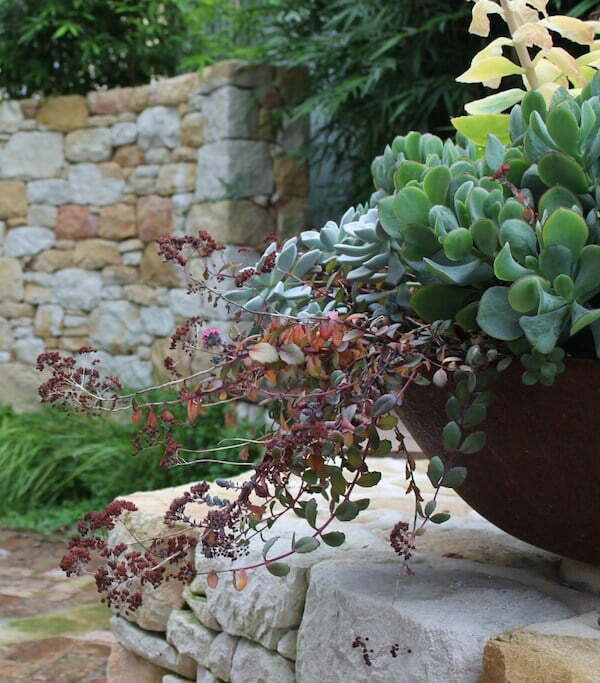 A number of simple decorative features were strategically placed in the garden to provide focal points. 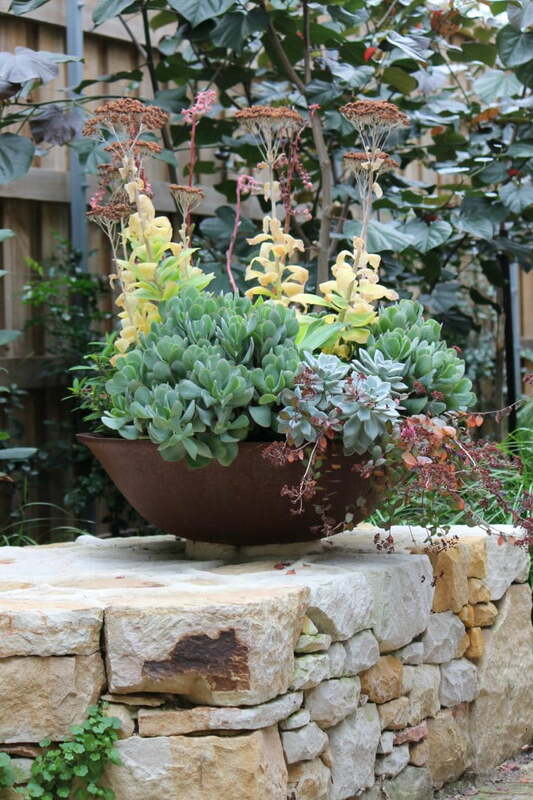 A large bowl, planted with succulents, provides a focal point from a number of places in the garden, including as one enters through the garden gate or descends the steps. 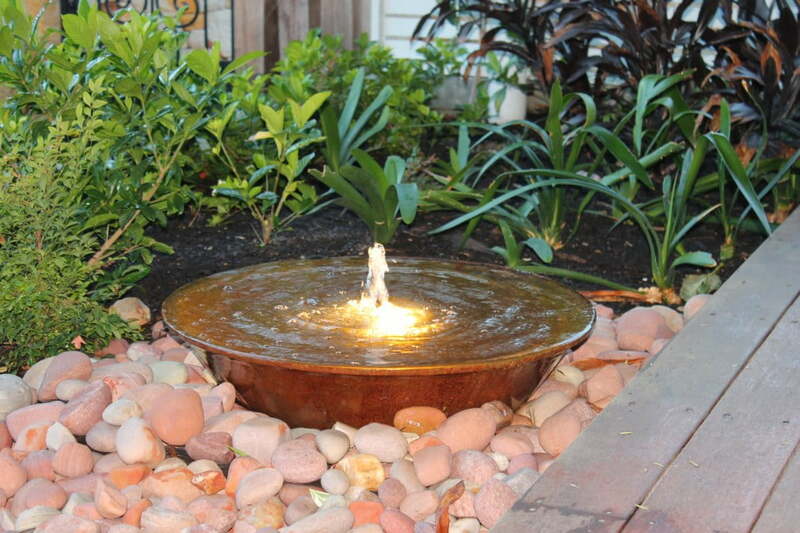 At the top of the steps the water bowl with bubbler introduces movement and sound into the garden. It provides a focus when viewed from within the living room, particularly at night when it is lit. A birdbath placed at the end of the river stone “path”, under the peppermint tree, enhances the sense of depth and distance in the garden and encourages birds to visit. The character of the striking Donnybrook stone walls, which bookend the garden, seems to change throughout the day depending on the light, and they positively glow when uplit at night. Additional lighting throughout the garden ensures that it can be enjoyed in the evening but sometimes all that is needed is the light provided by a fire in the fire bowl. Local landscaping company Lighthouse Landscapes implemented the plan, including constructing the vertical sleeper fence, and the stone walls were built by another local, stonemason George Gee. Many of the materials used came from the south west region surrounding Dunsborough, including the jarrah for the sleepers, the Donnybrook stone and even the river stones (which I believe were actually created by a glacier during an ice age). The clients assured me that, although it is still young, the garden gives them a great deal of pleasure. They love the perfume provided by the Stephanotis, frangipani and gardenias that are planted near the deck and they have been pleasantly surprised by the number and variety of birds that visit the garden every day. As the garden matures the Murraya paniculata planted on the boundary will provide additional perfume and the fences and nearby buildings will be screened out creating more of a sanctuary. Love it!!!! such beautiful set-out of quality materials AND room for softscapes that compliment. What I would give for access to that stone! I was very fortunate that my clients wanted a feature stone wall and didn’t balk when I came up with two! Clever. It already has a nestled-in feel. Love the way it has intimate nooks but isn’t completely screened from outside. It is easy to feel hemmed in when the house doesn’t have a street frontage but hopefully the open sleepers help, in a small way, to avoid this. What a clever design Linda. I love the way you’ve added the curved walls to break up the boxy rectangular shapes. And you’re so right about changing the position of the steps. It’s such a common design error to position the access points to paving or a deck in such a way that it turns the whole area into a passageway, instead of an access route with a separate sitting zone.